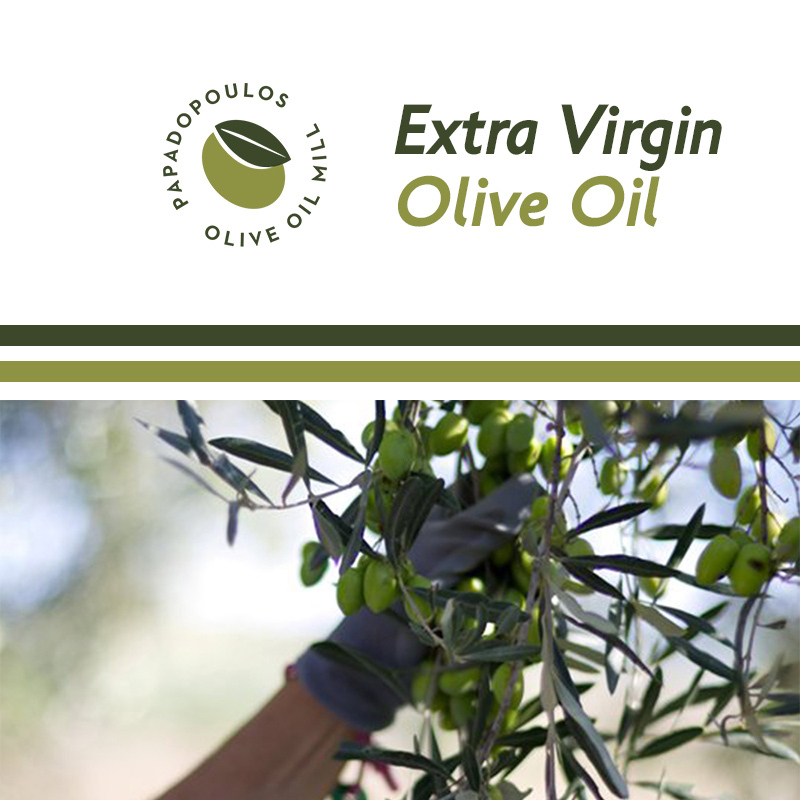 We are proud to be a family owned business named Papadopoulos Olive Oil Mill, which has been operating dynamically in the olive oil industry since 1989, when we created what has become one of the most ultramodern olive mills in Greece. We are located close to the sacred land of Ancient Olympia and maintaining the revival history of the past we are constantly producing with confidence on what the people of our region are used to consume throughout history. We produce the highest quality Extra Virgin Olive Oil exclusively in our olive mill according to the strictest EU’s standards and rules. Always with respect to the environment we own and operate cutting edge equipment, whereas an expertise knowledge combined with a constant scientific research we ensure for our customers consistently high quality of extra virgin olive oil from production to consumption. By continuously improving our facilities and expertise, Papadopoulos Olive Oil Mill has become synonymous with the highest levels of quality and innovation, a true leader in the premium extra virgin olive oil industry. We know that through innovation and respect in both the cultivation and the environment in our production process we can contribute to a perfect product of highest quality for the consumer. Quality is not just a myth. We trust in a future built on our past with passion and love for the precious liquid of olive oil, respect on the environment and ever growing research. Our team always works towards achieving the excellence and our philosophy is to highlight the unique flavors and aromatic characteristics of our region, Ancient Olympia, with our utmost respect to the environment and biodiversity, through the production and packaging of premium extra virgin olive oil. Our team in cooperation with expert scientists in the field of olive oil try continuously to analyse each variety separately and discover varieties which are rare, yet precious. A result of these studies, is the discovery of the variety Olympia (Nemoutiana), which although it was ready to be vanished we achieved to prove its big content in phenols and unbelievable aromas winning a number of awards in global competitions. Consequently, a lot of producers showed again a positive attitude to its cultivation resulting in its final maintenance and growth. We are really proud not only because we managed to revive this ancient variety, but of the premium extra virgin olive oil which produces. We are committed to continue with the same passion and devotion striking for the protection of the environment and the development of the premium Greek extra virgin olive oil. From tree to bottle whereas vitality has the highest priority. It is here where our family-owned olive trees cover the carefully cultivated farmland of Ancient Olympia and where we harvest our olives for producing our highest quality organic extra virgin olive oil. Our olive groves follow a strictly organic cultivation in a progressing level of certification to be Demeter (biodynamic). Demeter is the brand for products from Biodynamic Agriculture. The process of the grove cultivation excludes the use of synthetic fertilizers and chemical plant protection agents in olive fruit production, or artificial additives during processing, but also requires very specific measures to strengthen the life processes in soil. Our olive grove has developed over the years always with the utmost protection of the environment. Thanks to our expertise team combined to the strict scientific principles and its constant search for quality taken to the extreme, we manage to control each production phase. Papadopoulos Olive Oil Mill is one of the most modern oil mills in Elis / Ilia regional unit with the latest technology oil machines and all certifications for the production of organic olive oil concerning the integrated olive oil management and Olympia Protected Geographical Indication. After many years of research and testing, in cooperation with many distinguished scientists in the field, we are the unique oil mill that is able to regulate the intensity of fruity, bitter and spicy, depending on the preferences of the customer who trust us. Based on the experience and expertise we own, we are able to answer any question and to face any difficulty you may have, concerning the production of extra virgin olive oil and in order to get the best final result you desire. We are equipped with all the facilities and requirements necessary to ensure the complete monitoring of the production chain and the quality of the products at all stages of the production process, under the intense care and direct responsibility of our expertise team. The customer is a partner for us and we are eager to meet partners to share our common philosophy. Through our cooperation, with both evolve in a common goal: the production of the highest quality of extra virgin olive oil.